The Industry Buffet is a unique combination of materials, giving it a look of modern and transitional at the same time. The top is made of concrete that is sealed and stain resistant. 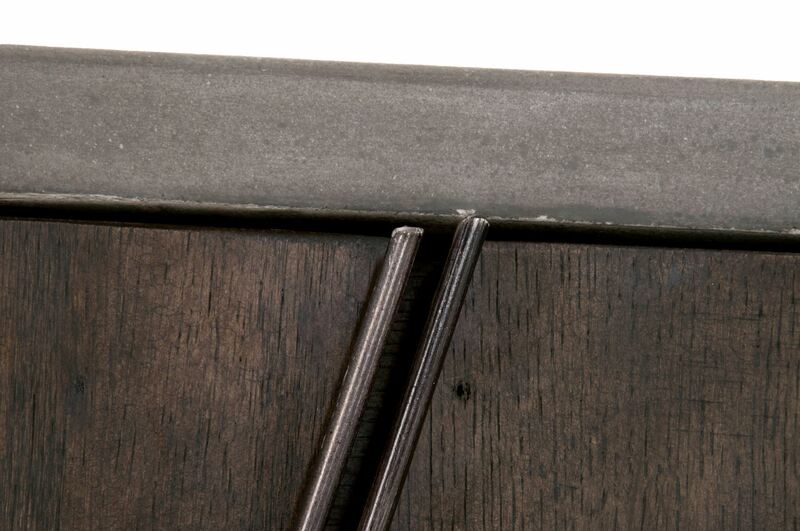 The cabinet itself features unique angles, and is crafted in oak with a matte sheen deep whiskey tone. The handles and legs are crafted in distressed iron. There is a single cutlery drawer, and two interior wood shelves. 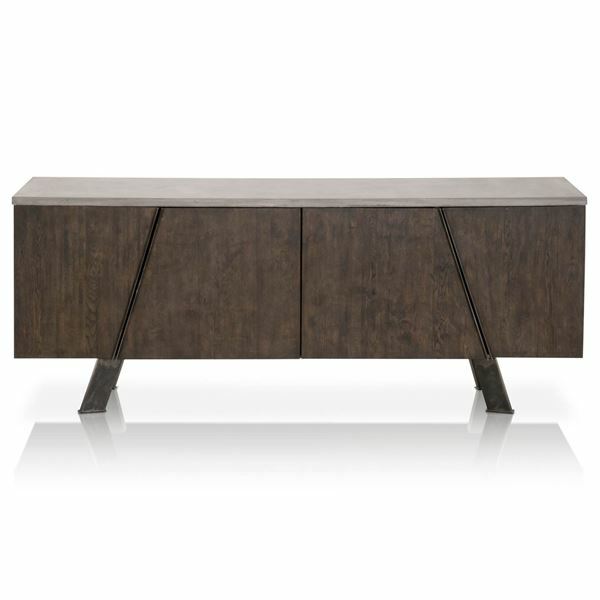 Because the design is so unique, you an also use it as a media cabinet, or in your entry way as a larger scale console sideboard. Box 1 -- 263lbs | W:81.5" D:22.5" H:28"
CONCRETE CLEANING AND MAINTENANCE Fiber reinforced Natural Concrete (FRC) Our concrete products are comprised of natural materials only, granite stone powder, Portland cement, natural Jute fibers and water. Much like any natural material such as wood or stone, concrete is a porous material. We have sealed your concrete with a wax sealer that will provide active protection against staining. To ensure the lasting beauty of your concrete surfaces we recommend reviewing and practicing the following care and maintenance instructions. After Installation The product has been sealed for protection against moisture and staining. Once the pieces have been waxed we recommend allowing them to remain free of objects on the surface for at least 6 to 12 hours. This enables the wax to penetrate the material evenly before the beginning of regular use. The wax we use is a paraffin based substance that hardens the material and protects the surface from staining. Cleaning your Product Clean your FRC product using mild soap (such as dish soap) and water. Do not use heavy abrasive, bleach-based, or ammoniated cleansers. Use of such cleansers will wear down the wax protection and result in less stain resistance. We do not recommend use of most natural cleansers (which are often citrus based), as the cleaning agent is typically highly acidic and can damage natural materials. Regular Maintenance - Re-wax periodically. Waxing your product regularly is a quick and easy process that will provide additional protection against staining. Wax once within 2 months of installation of your product and every 3 to 6 months thereafter, depending on use and location. If the product is placed outside, wax it well before winter. Cover and raise off the ground! Recommended product for this is our Repair and Polish Wax or any other commercially available Stone floor fax on paraffin base. Avoiding Stains: Regular food preparation will not stain the concrete as the sealer and wax serve as active barriers. In the event that the coating is knowingly cut, scraped, or damaged, new wax should be reapplied. Spills should be wiped up as soon as possible. While the waxing performs well against stains from oils and acidic materials, prolonged exposure may cause penetration of the sealer and possible discoloration. Expect occasional rings to appear from unknown liquids. Oils in particular can penetrate the surface if forced in from the weight of a glass or jar. Wiping up oil spills can minimize staining. Please note that bath oils in particular should not be used as they will cause staining from being left in contact with the surface of the concrete for too long. The first stain is always the worst. Expect the wear of your product to contribute to its uniqueness. Using felt or rubber feet pads is recommended for the bottom surfaces of all objects left to remain on the surface of your product indefinitely, especially unglazed ceramics such as terracotta pots. Unglazed ceramics compete for residua l moisture in the concrete and may cause discoloration. Do not place hot objects on the surface as they may cause discoloration. Using a trivet is recommended. At any point, refrain from putting blue painter's tape or other adhesives directly on the product. Although not considered a defect, non-structural hairline cracks are possible and may result from shrinkage and the natural curing process. If hairline cracks do appear, immediately apply a thick coat of wax and rub in well to prevent moisture from seeping into the cracks and causing discoloration. Re-wax the area and surrounding surfaces periodically as detailed above. 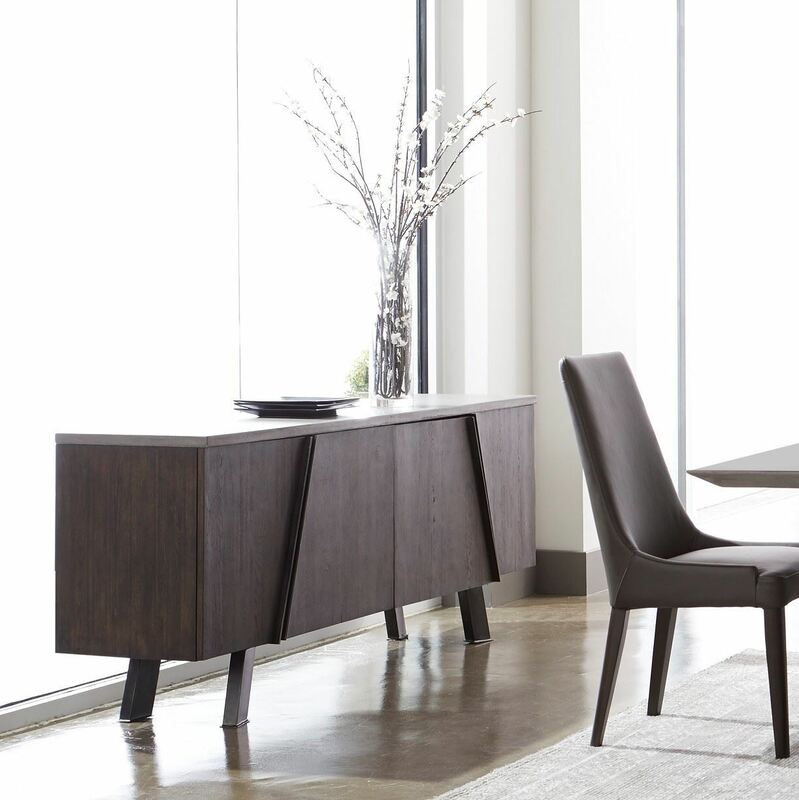 The Industry Dining Table by Star International Furniture. This awesome design begins with a slab concrete top, precisely formed with a reverse underside bevel. Corners and edges are eased. 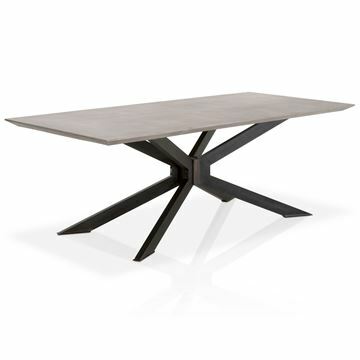 The reverse bevel of the top creates a perfect transition to the angles in the natural steel base. 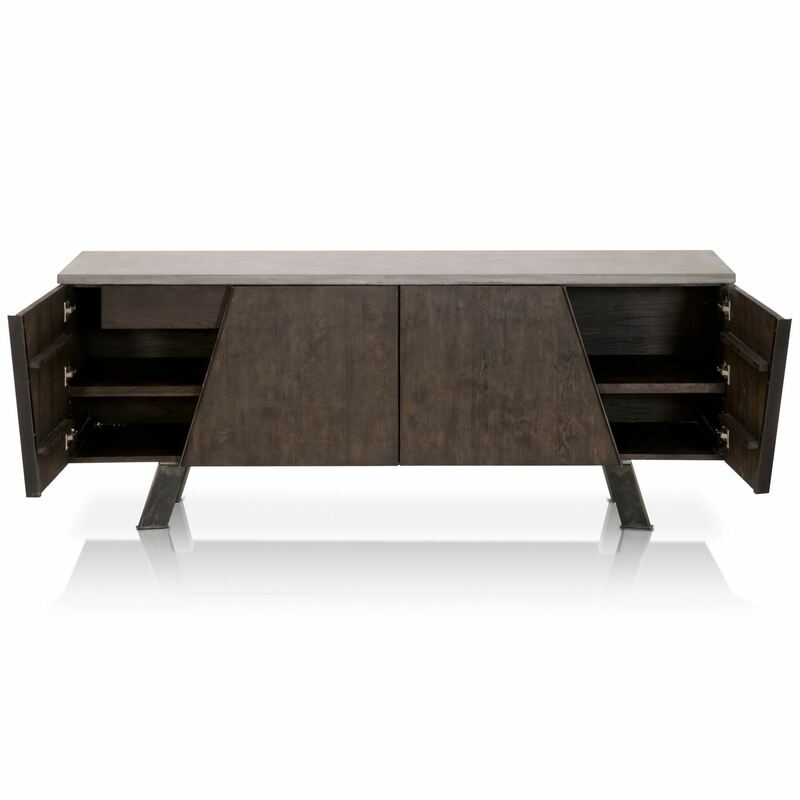 The steel is finished in a distressed black, giving the overall design an industrial chic visual appearance. 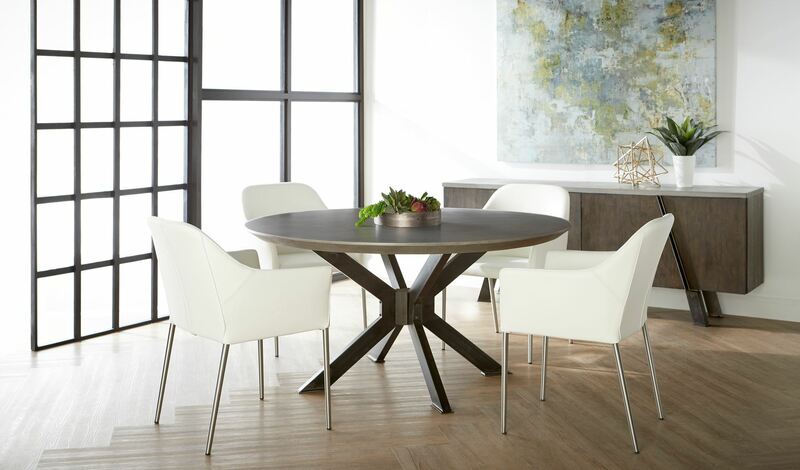 The 60" Round Industry Dining Table by Star International Furniture. 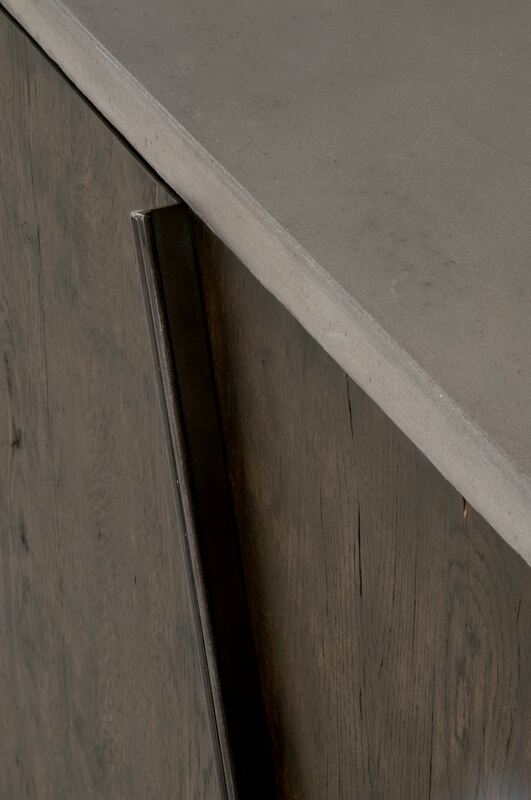 This awesome design begins with a slab concrete top, precisely formed with a reverse underside bevel. Corners and edges are eased. 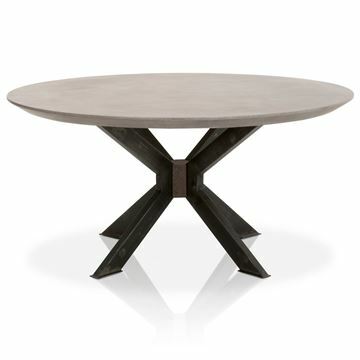 The reverse bevel of the top creates a perfect transition to the angles in the natural steel base. The steel is finished in a distressed black, giving the overall design an industrial chic visual appearance.